In order to be placed in the candidate herdsire pool, bucklings must be a twin or better, and must be in the top third of the 120-day weights for their contemporary group. They must also meet minimum standards for scrotal size, must not require hoof trimming, and must have two clean teats. We do not breed for conformation, but bucks must be free of any defects that could affect soundness. Candidate herdsires must also have a dam that is a good performer in our herd. The Kiko is a maternal breed. Therefore, the characteristics of a buck's female relatives are of primary importance: litter size, udder conformation, maternal abilitiy, and weaning weights. We prefer dams who produce large kids at weaning, while being of modest body size themselves. We generally do not sell bucklings as breeding stock because we prefer to wait until young bucks have undergone winter survival and parasite loading testing. We have found that it is not possible to reliably predict long-term hardiness based on a buckling's early performance. This chart shows 100-day winter weight gains in a group of yearling bucks on our farm. It is an excellent illustration of the effects de-worming can have on a herd, and the inevitable outcome of selecting breeding stock from herds that are universally de-wormed. It also demonstrates one way that we continuously select our Kikos to survive and thrive with natural parasite resilience. The blue diamonds represent a varied group of yearling bucks that were de-wormed for the first time in late December at about nine months of age. At that time, they had all been eliminated from contention as herd sires. Some had not produced the weight gains we would expect in a top buck. Others had done well, but were singles or there was some other undesirable characteristic in the buckling or his dam. The chart shows that these de-wormed bucks gained 12-21 pounds, with all but two of them within a narrow 5-pound range. Regardless of their previous performance, these bucks put on weight at a remarkably consistent rate, compared to the other group that was not de-wormed. The green squares represent bucks that had been selected as potential herd sires, and so had never been de-wormed. They were the top gainers in their first nine months, and were progeny of does that had done well in our herd. 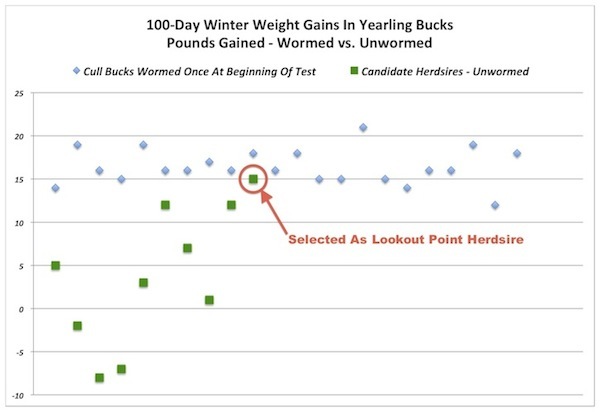 The chart shows a dramatic difference in how well these un-wormed bucks made it through the same 100-day period in the same pasture; they ranged from a loss of 8 pounds to a gain of 15 pounds. Despite the poor performance from some candidates, the best buck gained within one pound of the average for the de-wormed group - and was the one we chose as our next herdsire. Parasite resilience and other desirable traits must be tested in at least some of the herd if they are to be retained through generations. Click here to read more about breeding for parasite resilience. However, the cost of performance testing can be quite high, as the above chart shows. The average gain for the un-wormed group was 12 pounds less than for the de-wormed group. At a market rate of $1.50 per pound, that makes a difference of $18 per head, using a product that costs less than a dollar per dose, over a period of just 100 days. If parasites did not become tolerant of the products meant to kill them, we would have little reason to withhold de-wormers. Unfortunately, parasites are rapidly evolving to tolerate de-wormers where they are heavily used. A study in the eastern US found widespread de-wormer resistance, approaching 100% for some products. Our goal is not to eliminate de-wormers or to convince anyone not to use them. It is to reduce the need for them and to use them in a way that leaves enough parasites unexposed, so that they do not evolve to become tolerant of these valuable management tools. If we can produce bucks with superior parasite resilience, they can be used to reinforce this trait in herds that receive more regular de-worming, making it more practical for our customers to reduce their use enough to slow or stop the evolution of parasites that would make them ineffective. By far the shortest route to improving parasite resilience in a goat herd is by using resilient breeding bucks.